As much as I love my suzuki Teach, I decided to take a lesson from the fiddle teacher at the music store where we jam. Teach is an awesome teacher and musician, but she is a classical musician. After one lesson with who I will call JamTeach I did great!! I was able to remember my tunes started and finished them. I think I did around 5 tunes. Everyone was complimenting me on my playing, it was awesome! Of course I made a few mistakes, but at least I know I was not torturing them!! Here is one thing that did the trick - CONFIDENCE!! I mentioned to JamTeach that I was worried that I was torturing the fellow jammers. He said he had heard me play at the jam. When I started playing for him he had a surprised look and said, you are a much better player then how you are playing at the jams!! The other thing - learning about TEMPO. 1. Not every tune played at a jam needs to be fast. 2. At jams people tend to speed up the tune as they play. 3. Good players keep a steady tempo. 4. I thought had been sitting between players who's tempo fluctuated greatly. That was confirmed. 6. There are obviously various levels of players at jams. It is extremely difficult to learn how to play an instrument at a jam. JamTeach suggested I practice with a metronome and learn the different tempos 3/4 time @ 80 beats for Ashokan Farewell and other waltzes. For Soldiers Joy and 8th of January 4/4 time @120 which is dance time. After just 3 days with the metronome I was able to tell the exact point during our jamming where we were speeding up and when I was leading was able to force a slow down!! Ahhh the power!! I am now a sworn foot tapper!! Agreed! Great tips. I've just started going to jams, so I'm trying to figure out the dos and don'ts. This helps a lot! Thanks. Tempo is easy to spiral up in a jam, unless folks are working to keep it steady. But that's not all. LOL Especially with electrified instruments, volume spiral is also a problem. Somebody doesn't feel they are loud enough, so they turn up just a little, and then somebody else turns up a little and before you know it, the police are knocking on the door. I learned, 60 years ago when I stopped playing violin at age 10 and started playing guitar to TAP your foot. It can certainly help with staying on the beat, but I've seen people creep up tempo while tapping a foot too. Feet do not come with precision speed settings. Tapping the foot is great and yes, people change tempos depending on what they are playing while doing so but it's also a bad habit for some. Personally, I think it can add a lot if you're performing popular music and your foot is the rhythm section. I've never really found foot tapping to be of help in solving problems with timing. Sometimes it's helpful to me if I am working on an unfamiliar, tricky piece, going slow to try to understand the timing. But, as for jams, and being onstage, I try to get away from foot tapping. When I play onstage, I am almost always standing, and I don't find the tapping useful. Really, in the end, the timing has to come from your head, down through the fiddle. I attend a lot of concerts by professionals and I observe them. The musicians are usually not tapping their foot (country, bluegrass, etc.) If they are, it is mostly, I suspect, because they are enjoying the music and getting into the tune/song, but not because they are trying to keep the beat with their feet, which would tend, I think, to actually be distracting. For me, needing to tap my foot means the piece needs more work on my part, until I can feel it. Agreed > I tend to tap when I am trying to get my self back in sync > A kind of Chi thing when the mind\soul\spirit extends out to the fingers and expresses what one feels > that ROCKs!!! > to be ONE with your instrument. I agree! Nothing like that feeling going through the whole body! Now, what I would really like to get a handle on is that clogging business...I'd love to do that while someone else is doing their break! Talk about feeling the music! And I am sure the crowd likes it, too. By the way, I switched to playing a 5 string almost a year ago, a Dahlia, and I got my old 4 stringer out yesterday and it just wasn't the same. Of course, the Dahlia is a sweet sounding instrument. My point here is that for playing in jams, and helping others out at open mikes, it sure seems to add additional layers of sound. Anybody else jam with a 5 string? I've done it a few times but do not have much experience with the 5 stringed violin. It's a lot of fun but I would need to spend time to have the same confidence that I have on my regular fiddle. I'm a bit of a "Johnny-Come-Lately" to this thread but it sounded like a good read. While, I don't have experience playing at jamz on the Fiddle, I DO with the Mandolin and I used to play in a Bluegrass band and attend folk jamz also. Here is one thing that did the trick - CONFIDENCE!! I mentioned to JamTeach that I was worried that I was torturing the fellow jammers. He said he had heard me play at the jam. When I started playing for him he had a surprised look and said, you are a much better player then how you are playing at the jams!! - That's great! He paid you a great compliment and was encouraging you to participate. These jamz teach you alot about timing, playing with others and team work. 1. Not every tune played at a jam needs to be fast - I agree. In Bluegrass, some bands play TOO fast at times. The music needs to have drive and push the beat a little, but not just be playing soo fast that it's a flurry of notes going crazy. My grandfather from Kentucky, he's an ole country boy and he and my grandmother love to square dance and he used to say to me: "Son, never play your music any faster than the good folks can dance too!" There was alot of truth to that. Some Bluegrass and Old-Time bands, albeit fabulous musicians, they forget that sometimes. I think the Old-Time folks are better than the Bluegrass folks when it comes to this. 2. At jams people tend to speed up the tune as they play - Yeah, I think that's typical. Some folks are maybe nervous and when were nrevous, anticipating a coming break or fill we want to add, the music is exciting so we might push it a bit. I think it's better to "push" the beat some than drag it down. If it drags down, the music loses it's feel and rythmic bounce. 3. Good players keep a steady tempo - Without a doubt, the best ones with the best timing, lock it right in there. If the Mandolin chopping the back beat and the Bass thumping the on-beat are right on, folks should be able to lock in pretty well. 6. There are obviously various levels of players at jams. It is extremely difficult to learn how to play an instrument at a jam - True, but if you can get in with a jam of musicians that are really good and above your skill level, it's priceless. It really is like a free lesson. Even though sometimes I can barely hack it, I prefer to get in with folks who are really stellar musicians so I can learn grow. I call it "playing up so I can grow up musicially" Seek out the really good musicians ( Like Fiddlerman ) and stick to em like glue and watch and listen to "everything" they do. Even so, it sure is humbling! JamTeach suggested I practice with a metronome and learn the different tempos 3/4 time @ 80 beats for Ashokan Farewell and other waltzes. For Soldiers Joy and 8th of January 4/4 time @120 which is dance time - Whooo...120 BPS on the Fiddle for me is well above my tempo "play grade" at this time! If I can play at half that speed and keep it clean at thgis point, I'm happy. I ALWAYS play with a metronome on my Iphone with ear plugs ( I see Fiddlerman does also ) I can't stress how important that is. Always practice with a metronome of some kind. After just 3 days with the metronome I was able to tell the exact point during our jamming where we were speeding up and when I was leading was able to force a slow down!! Ahhh the power - Awesome! With me also it helps me to get a feel for the bowing when to change certain notes and double-stops....I wouldn't feel right without it! awesome tips. I like your contribution to this thread for sure. I'd say the last time I was in a Bluegrass jam or involved in Bluegrass music or bands was around 2006, so it's been 8 year or more I've been out of the scene. I'm trying to get back into it and have decided to pursue my dream since I was a kid...to play the Fiddle. It's kind of a revenge thing too. 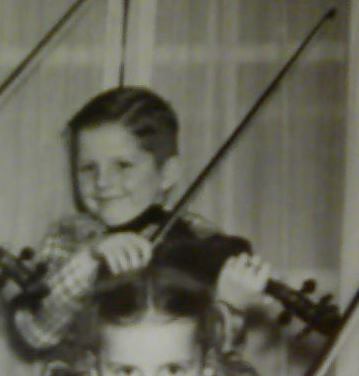 I asked for a Fiddle when I was kid starting middle school, I begged my parents for a Violin, but they refused, told me later they thought it was too difficult for a youngster at the age I was then. I'm going to make them regret every word!! Anybody else jam with a 5 string? I do, although I don't really use the low C string very much, apart from the odd drone here and there. Yeah, on some other forums, there's a few guys who have those 5 strings and a few of them said there's no big deal in switching and a few of them say there "is" that it's quite different. I see that the 5 string Fiddle seems to be a growing trend with alot of Bluegrass fiddlers, and actually Texas fiddlers "have" used them for quite some time and if I'm not mistaken, they are the ones that have kinda given the 5 stringer it's current level of popularity. Johnny Gimble the famous Texas fiddler who wrote "The Gardenia Waltz" usually played a 5 string Fiddle. Texas fiddling uses alot of double stops and 3 string chords and diff things, so I guess they like that extra "C" string for that bottom end. Even so, I'd like to really know "how much is that extra string really used" and what kind of real benefit one could gain from it. Seems to me still more of a novilty at this point. There arer "8" string fiddles as well actually. Bluegrass fiddler Michael Cleveland in his band "Flamekeeper" uses one on a few songs. Just for kicks & giggles: here's Michael with his band playing his 8 string....see all of the white pegs? By the way: Michael Cleveland was born completely "blind at birth" and got his start playing Fiddle at "Kentucky School Of The Blind" in Louisville Kentucky. He's a fabulous Fiddle player, very non conventional, but fabulous none the less. he's playing an old "Benny Martin" tune called "Me and My Fiddle" and it's a very "Texas" tune with all of those double stops on those 8 strings done in the B'grass style....enjoy! Thanks Fiddlerman. It's amazing for being completely blind how well he can play, and his technique and style are soo unconventional, it breaks alot of rules but he sounds great! Another issue, IF I'm not mistaken, is that the string spacing on those 5 string fiddles is alot tighter also? Aren't they? And I'm sure that could end up being very problematic for folks who are used to 4 stringers also.. Even so in Texas fiddling, 5 strings have been in use for some years and very popular.